Taking into consideration the installation of Shree Samsthanam, the annual day is celebrated and since 2000-2001, the day is celebrated as Rathotsava or car festival. The Ratha Nirmana Samithi formed for this purpose prepared the Ratha by Swamiji’s grace and presented the same to Samsthanam. 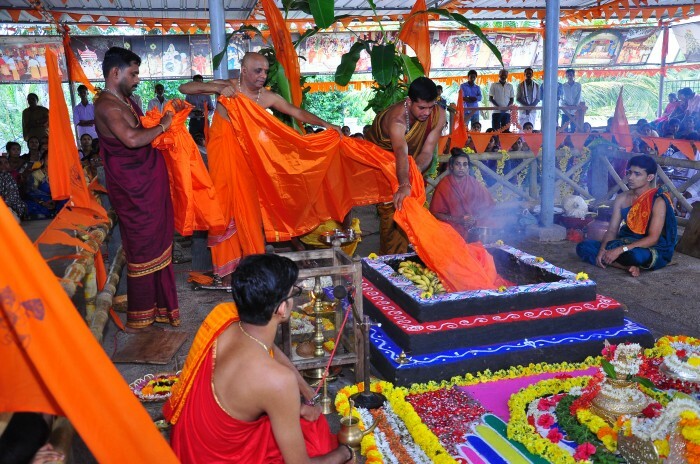 The God fearing devotees have rendered all help to the chariot project like to other programmes of Shree Samsthanam. Rathotsava is verily a feast to the eyes. The Utsavamurthy is taken in a grand procession to Mittanadka where the village deity is worshipped and then to Kanyana. After worshipping at Nithyananda Mandir the chariot returns to Sri Kshethra. The grand procession remains ever fresh in the minds of onlookers. Thanks to the various cultural and art events accompanying the Shobha yathre including Bombe Kunitha (dancing idols), Dollu Kunitha (dancing with drums), Keelu Kudure (dancing horses), Kavai, peacock dance and tableaus. People gather in thousands to have a glimpse of the Ratha-Yathra on bothsides of the route. 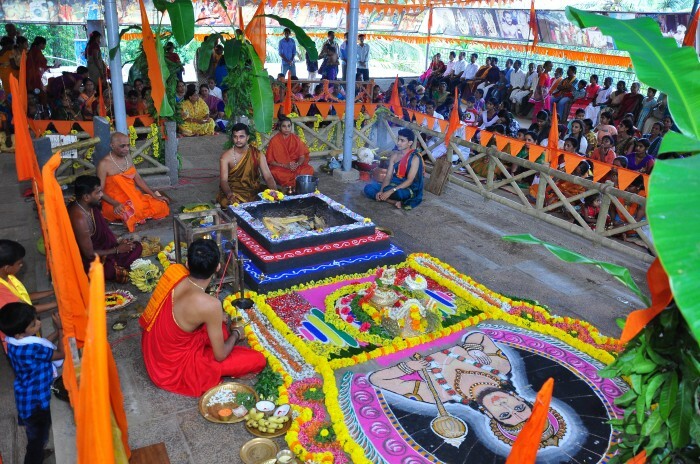 Devotees offer poojas to the Rath and offer aarthi and receive blessings from Swamiji and experience divine bliss. “Festivities should not remain merely a celebration. When they allow us to have introspection, then it is really worth it. The vibrant festivities should encourage us for internal purification. Co-operation, harmony, and exchange of feelings enhance the mass devotional mentality. A focused prayer has special power. However, we should have a pure mind that offers prayers to God with fidelity, devotion and dedication.” This is the clear stance of the revered Holy Sheer regarding the festivities. The birth day of Swamiji, the founder of and moving spirit behind Shree Samsthanam, is observed in collaboration with the sister organisations. The devotees of Mumbai have been celebrating the birth day at Mumbai too. The second festival is Hanuma Jayanthi. It is the birth day fete of Lord Hanuman, the deity worshipped at Shree Samsthanam. Along with temple rituals, religious meets and discourses are arranged in the presence of specially invited guests and vedic scholars. 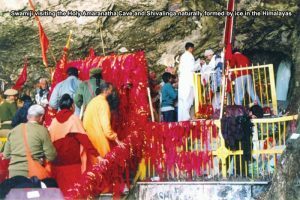 The shrine is known for the special grace of Lord Subramanya. Hence, Nagara Panchami and Ashlesha Bali are held. Devotees offer poojas and rituals in order get rid of Naga Dosha or evil effects accrued on account of the displeasure of Naga. 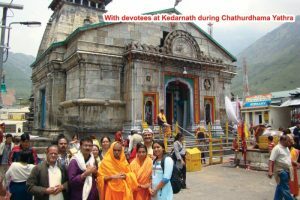 “Naga Darshan” inspires devotion among believers. Datta Jayanthi is held at Shree Samsthanam for a period of one week from Navami to Pournami (Ninth day of full moon day) along with Datta Mahayaga and other Datta Jayanthi rituals. Everyday Gurucharithre is recited as per Saptaha regulations and rituals. On the full moon day after Poornahuthi, Swamiji performs Madhukari Ritual (Receiving alms from devotees a bee collects honey from flowers) and thousands take part in the ritual and obtain bliss and feel blessed. Religious congregations and cultural events along with Vedic rituals are held on the occasion of important festivals at Shree Samsthanam. Normally religious meets are arranged in the evenings after mass feeding. Senior scholars, talented artistes and guests deliver talks on such occasions. Admirers of Shree Samsthanam and social workers are invited and honoured as special guests. Besides those who have rendered monumental services to the fields of religion, art, literature, music, education and medicine are felicitated. In Shri Samsthanam, constructive activities are executed related to education, food, protection and health without much ado. Eye checkup camp, heart-related disease test, blood donation camp and many other health-related services are conducted here. His holiness himself provides guidance to get proper treatment for various ailments. Many people have been treated successfully by his holiness. His holiness has already thought of two projects namely; Hanumagiri Arogyadhama and Adhyatma Bhavan where invaluable medicinal herbs can be preserved and grown, and spiritual enthusiastic people can comfortably enjoy retreat respectively. Many education institutions, trusts and community service organizations have come forward to participate in this mission.